Australians want to keep Australia Day exactly where it is – on January 26 – with 78% proud to celebrate Australia Day on that date, according to the latest Advance Australia poll. 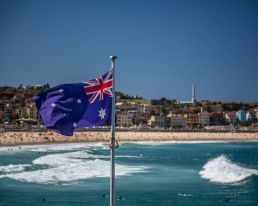 The poll put a series of questions to 1659 voters from across the country in the wake of the recent debate that has erupted over Australia Day and the date it is celebrated. Overwhelmingly, the poll found that Australia should keep the date as it is, with 71% of the nation in agreement. 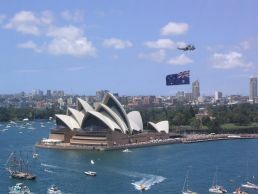 67% of Australians could identify 26 January as being the date the First Fleet landed in Sydney Cove. Out of the 78% of Australians proud to celebrate Australia Day on January 26, 98% of Coalition voters were proud, and 73% of Labor voters proud. 81% of Greens voters were not proud. 66% of Australians see January 26 as a day to celebrate our coming together as a nation. 77% of Australians believe Australia is becoming too politically correct. 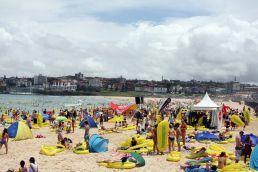 National Director for Advance Australia, Gerard Benedet, said that the results are only further evidence that Australians are committed to coming together to celebrate a country they are proud of on January 26. “The results are in – January 26 is not a day for division and protest, but rather a day for all Australians to celebrate – nevertheless we must remain vigilant,” said Mr. Benedet. “The poll proves mainstream Australians are overwhelmingly united in wanting to celebrate our country together – because at the end of the day, we are Aussies, and mateship comes first. Encouragingly, more and more Australians are also now understanding the historical significance of the date, with 67% of participants recognising it as the day the First Fleet landed in Sydney Cove. 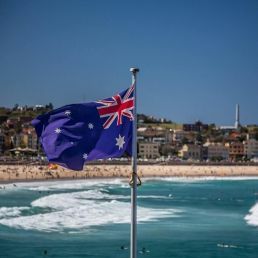 “Most Australians believe that moves to change Australia Day are solely for political point scoring purposes, and not for the benefit of our nation – it’s political correctness on steroids. So, while the results are overwhelmingly in favour of keeping Australia Day exactly where it is, the issue does not stop here. “42% of Australians said that they would not vote for their local member of Parliament if they didn’t support Australia Day being on January 26. We should be proud of our country and who we have become, and the best way to do that is to tell your local member to keep Australia Day squarely where it is, on January 26,” said Mr. Benedet. Remember when everyone thought cruising was all about standing in a conga line, waiting to serve yourself from a fairly ordinary buffet? 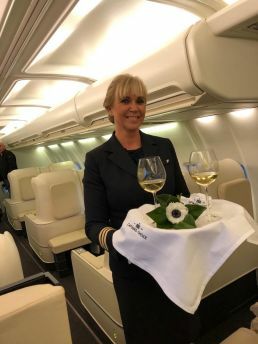 Well, not all cruise lines are created equal, with so many having now eschewed the wait-in-line mentality and given customers a really decent dining experience. Most of the major and more popular cruise lines are way up on their culinary act, so for those who may still be a little nervous regarding a cruise ships’ food offering needn’t worry at all. Be warned: not every cruise line has put the time, patience and resources into making their meals rock (in some cases, quite literally). 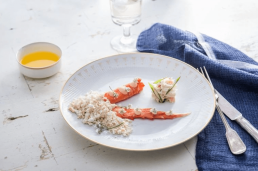 After a trip to the US to see how the Princess Cruises crew puts their entire food and event offerings together, which seems is no simple task, it’s clear that the effort is paying off in spades. With the Southern Hemisphere cruise season well and truly upon us, it seems each day there is a mega ship or two docking in a harbour or port somewhere is Austalia. And, it was Princess Cruises who invited me to check out its international operation. With that, I spent some time at the Princess head offices in Los Angeles to meet the people who are working behind the scenes to elevate Princess Cruises’ on-board experience. From working with a world-renowned sleep doctor to ensure a better night’s sleep for all its guests, to creating carefully curated menus with Michelin-Starred chefs, the Princess fleet wants to lead the pack in the world of cruising. It is also making sure its entertainment, suites, and, most importantly, food is top notch. 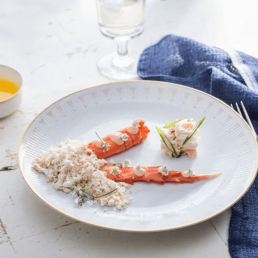 The concept of ‘ordinary’ food seems to be a thing of the past as major cruise lines continue to partner with seriously good chefs. The crew of us were lucky enough to meet some of the chefs engaged by Princess Cruises as we made our way to Los Angeles to see how the kitchen kinds work their magic. Here are a few whose tastes will tantalise ship ahoy taste buds. 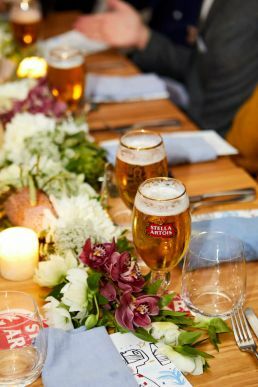 This LA-based gastro-pub has been turned into a star on the high seas with award-winning chef Ernesto Uchimura having joined forces with Princess Cruises. The chef is the name behind the original Umami Burger restaurant and also he also started Plan Check Kitchen + Bar in Los Angeles. 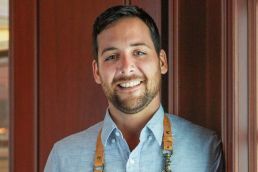 So popular his offerings have been on land, his The Salty Dog Gastropub experience has been transferred to the the Wheelhouse Bar on board some of the cruise lines’ ships. I mean, it must be quite an honour to have been voted as having the ‘Best Burger at Sea’ by Cruise Critic! 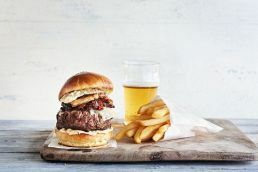 The on-board Salty Dog Gastropub also has the ‘The Ernesto’ – a crafted rib eye burger created by the chef just for sailing. 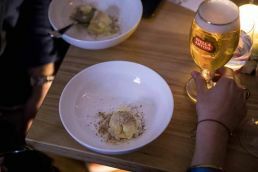 We had a taste on a gastro-tour, and yes, it definitely is worth a try. 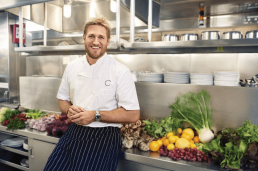 Princess Cruises partnered with the award-winning chef Curtis Stone a few years ago when he created SHARE. As the name implies, it’s all about, well, sharing, and with dishes like a charcuterie starter course; butter poached lobster with caramelized endive; twice-cooked duck leg with fennel, bacon jus and parmesan crumb; tagliatelle with roasted alaskan crab, chili and parsley and potato gratin with truffles and cream available on the ships Ruby Princess, Emerald Princess, and Sun Princess. 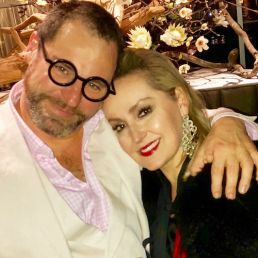 Another chef celebrating his sea-faring delights is from LA-based Italian chef Angelo Auriana, who has joined up with Princess to concoct a menu for six of the ships, including Golden Princess who is currently calling Melbourne home for the next 5 months. The restaurant, called Sabatini’s includes handmade pastas, risotto and seafood. 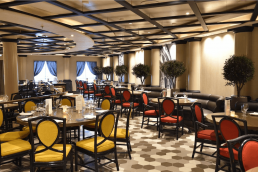 Exclusive to the majestic ship, cruise-lovers who are wanting something a little more casual, with an atrium style vibe, are mad about French, bistro-style dining with a contemporary twist at Ranaut’s restaurant called La Mer. The chef holds the title of ‘Meilleur Ouvrier de France’ (best craftsmen of France) and Chef of the Year by Le Chef. 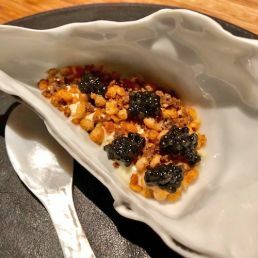 The chef’s locons de Sel restaurant has even received three Michelin stars. Now that, from any regard is mighty good form. In addition to the ‘celebrity’ chefs, Princess has a venue in Santa Clarita where all of their Princess menus are tested and tweaked. It’s called the Princess Cruises Culinary Development Centre and it’s where all the menus are created in LA, then rolled out across the Princess fleet across the world. Princess’ newest ship, Majestic Princess balcony fares for a 12-night cruise to New Zealand departing Sydney on Friday 25 January 2019 start from $2,689 AUD* per person, twin share. For more information visit princess.com, call 13 24 88 or see a licensed travel agent. Melissa Hoyer was a media guest of Princess Cruises in Los Angeles to’ meet the chefs’. 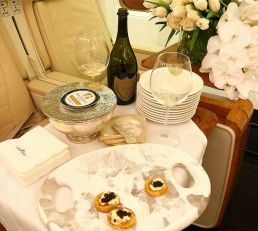 Private Jet love with Captain’s Choice. Now THIS was a real experience. 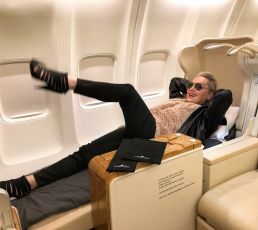 Ok, we didn’t quite leave the private jet base in Sydney, but we did jump on board the 50 seat jet to hear about a seriously chic travel company called Captain’s Choice. 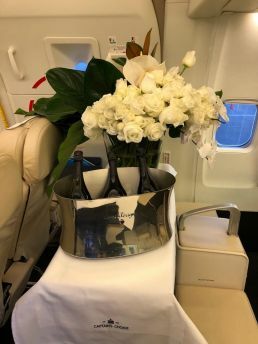 With Dom Perignon flowing and caviar served, a throng of travel media enjoyed what was an hour experience – where we wished that one day, maybe one day, we’ll make it into the sky and onto a destination like India, Iceland, Antartica and South Africa. Here are a few of the facts…. Since 1994 the company (CC) have created the world’s most enriching journeys. 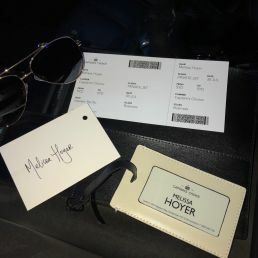 They take their clients to all corners of the globe without compromise, whether by private jet, small luxury ship or a unique rail journey. 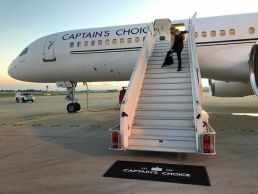 The clients appreciate the inspired moments can only be experienced travelling with Captain’s Choice. 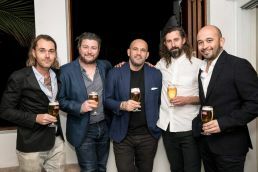 Through innovation and fresh thinking, CC continue to push the boundaries for clients, leading the market with high staff to guest ratios, genuinely all-inclusive tours and real and lasting engagement with many of the global communities they visit. Thinking beyond travel, CC endeavour to curate fresh wonders, delivering inspired moments that money can’t buy. Rob Tandy is the Executive General Manager of Captain’s Choice and a director of (and part of the family behind) one of Australia’s most important travel groups, APT. Rob joined the group in 2012 as General Manager of the Kimberley and Outback Wilderness Adventures business and took on the role as head of Captain’s Choice in 2016. 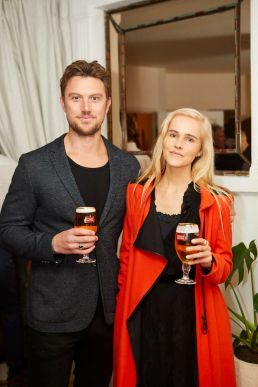 He holds a Bachelor of Science and a Masters in Property and Construction and is also a Director and Co-founder of a leading Melbourne charity, the Snowdome Foundation. 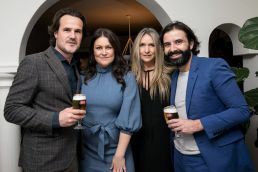 Lou Tandy (nee McGeary) is Director of Captain’s Choice and works in partnership with her husband Rob Tandy to drive strategies for growth of the brand. She has over a decade’s experience in product development, strategy and marketing with Australia’s largest locally owned touring company, APT, and joined its board of directors in 2005. Lou has grown up immersed in the travel business, as she is the daughter of APT founder and owner Geoff McGeary OAM. Nothing more exciting than going to an opening night. And a restaurant re-opening night at that. 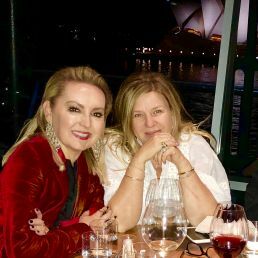 And while Quay, one of Sydney‘s best restaurants has been on hiatus since April, 3 mates and I decided to book a table to celebrate two birthdays on the opening night. And yes, we were always going to be in for a treat. 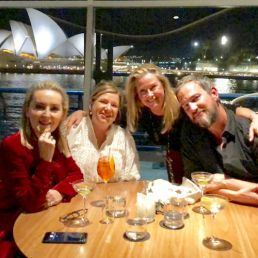 Quay – the restaurant on top of the Overseas Passenger Terminal in Sydney has been a culinary icon for years, expertly run by chef guru Peter Gilmore, who, in this incarnation, is supported by 35 extraordinary staff. I could go on and on and on – and I would love to – but to be honest, instead of dissecting each & every course, I want to give you a feel and vibe of the place. Oh. And of course, we have to talk food! Here are some of my take-home musings. (By the way the duck is extraordinary! 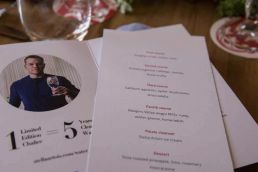 )And that wine list – it was like a Bible with a couple of pages dedicated to just about every vintage of Krug champagne. 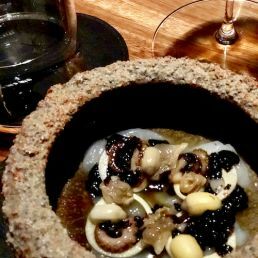 Have a look at the 10 course degustation here – but there is also a six course one which is what we decided on. 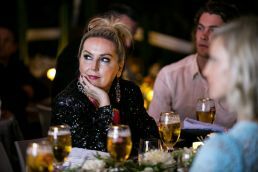 I’ll start with the lighting – when you first sit down the overhead down-lighting (a tad unflattering) is quite bright so you can peruse the menu comfortably – and with well over 500 wines to choose from you could be there for hours! Then, as your meal goes on, your above table lighting adjusts so the ambience feels cosier. Direct downlights are nobody’s face friend! 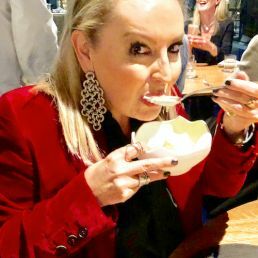 It is like fine dining has been deconstructed – the interior (by Tonkin Zulaikha Greer) is cleaner and leaner, seating 80 people, not 100 like before. 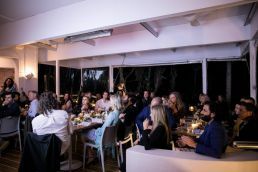 There’s a private dining room and event space – all with that killer Sydney harbour view. And instead of the famous & now retired Snow Egg dessert, Peter has created something called White Coral. Worth saving up just for that. 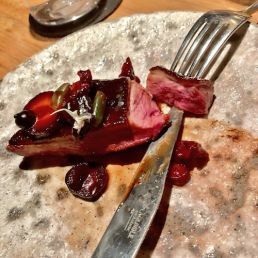 Quay isn’t inexpensive but It’s a true culinary experience with a staff who know their stuff back to front. 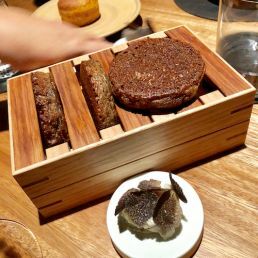 Try a malted barley crumpet with truffle and you’ll get the picture. And all food requirements are catered to. 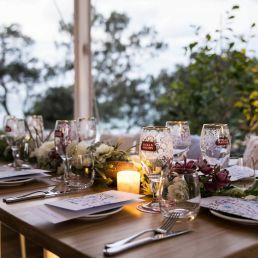 I loved the sustainable solid spotted gum tables which were devoid of linen – & you are surrounded by materials derived from nature including some stingray patterned divides, volcanic lava stone with a pattern that looks like cracked bark and there is a series of blue carpet pools, referencing the ocean, of course. Put it on your edible bucket list. 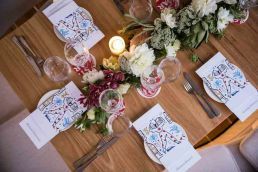 And even better it wasn’t all quiet, reverential and serene: while our table was probably the loudest (sorry) it also proved that having fun, laughing (a lot) and fine dining are able to go hand-in-hand.